Junior doctors have lost their quest to get permission to appeal against a Labour Court ruling that ordered them to end their month-long industrial action. The doctors had filed an application for leave to appeal in a bid to challenge justices Betty Chidziva and Gladys Mhuri's ruling that the medical practitioners did not follow the notification procedures prescribed by the law when they embarked on the industrial action. 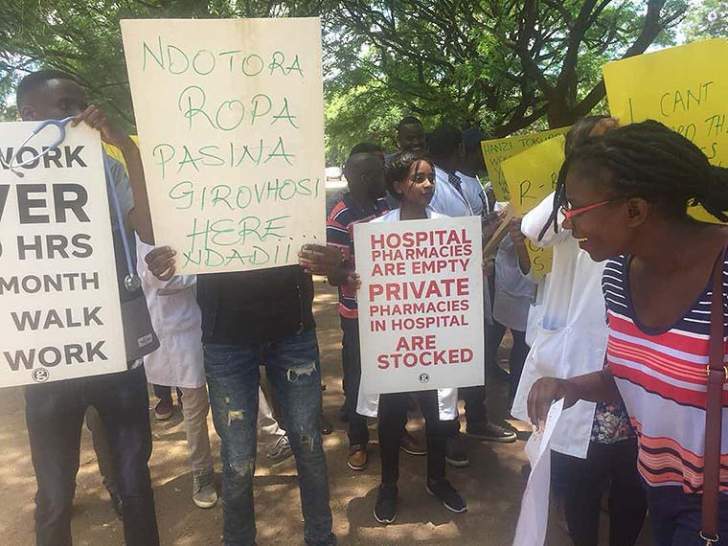 In the application, the applicants were the Zimbabwe Hospital Doctors Association (ZHDA), the association's president Elias Muzoremba and the organisation's secretary-general Mthabisi Bhebhe, while the respondent was the Health Services Board (HSB). In her ruling, which dented the doctors' prospects, Chidziva said the matter was not urgent. "It is ordered that, the matter not being urgent, the registrar is directed to enrol the matter on the ordinary roll and proceed as such. The applicants to pay costs on a higher scale," the court ruled. The ruling comes as a blow to the doctors, following the previous order in the main matter, stating their industrial action was illegal and contravened provisions of the Labour Act. "The findings of the court, in terms of Section 107 of the Labour Act, are as follows: Having listened to both parties' submissions, the court found that the collective job action embarked on by the respondents (ZHDA) and its members on the 1st of December 2018 is unlawful. "This finding is based on the fact that the respondents in the critical services category, as provided for by the provisions of SI (statutory instrument) 137 of 2003, are prohibited from engaging in collective job action," the court ruled. "Respondents (in the main matter) even, through their witness Dr Muzoremba, failed to prove that they were exposed to any occupational hazard which they reasonably feared to pose an immediate threat to their health and safety." The court further ruled that no evidence was presented to substantiate the claim that the doctors embarked on the job action to avert an immediate threat to their health and safety. Following these findings, the court ruled that: "All members of the Zimbabwe Doctors Association, doctors and members of staff who participated in the unlawful job action should report for work within 12 hours of service of this order on the Zimbabwe Hospital Doctors Association at Parirenyatwa Doctors' Lounge, Harare." According to the ruling, HSB was to dock salaries of all doctors and medical staff for the number of days they did not report for duty. "The Health Service Board is entitled to take disciplinary action against members of the Zimbabwe Hospital Association, doctors and members who participated in the unlawful job action and also that the respondents are to bear application costs on the ordinary scale," the court ruled.